"And the great civilisations of man had a rotten core and collapsed, and the last champions of humanity were overthrown by beasts and barbarians." Hello all. Perhaps a little strange thread, but I never ended the role playing game The Age of the Beast. Waaagh! is planning to start a new version, so I’d like to finish before he starts. Other than that, Luna threatened me with torches and pitchforks and Pecten keeps telling me for months that I still need to end it. Feel free to add any comments, IC or OOC, whether you were in this game or not. Turquoise is Luna Guardian's Quelaran, grey is Tylarion's Therrador, dark green is Ferretsnarf's Stoatoic Empire, yellow is Ashnari Doomsong's Errechania and brown is Waaagh! 's Drogor. 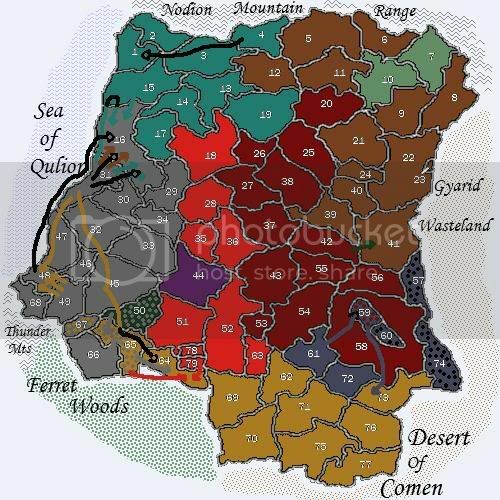 The remains of Shadow's Kingdom of Silesia are light green and belong to Drogor now. Purple used to be Raukov's Moriyen and dark red is Pecten Kalderon's East Fellonia. My NPCs are West Fellonia in bright red and the Order of Richar in marine. Further of note is that the areas 30, 31 and 32 are home to Snail's Snailglorbs. This land of Shelldormya is for a long time now a province of Therrador. The smilies are at the player capital cities and indicate the happiness of its inhabitants. Below you can see the movements of the final turn. The arrows mean movement of units (with colours corresponding to their owners), black arrows mean movement of a nation's units within its borders, dots mean the area is being conquered by the nation of the dots colour and black dots mean a nation can no longer maintain control over an area. - The knightly order of Richar is defeated by the Fellonians. Its capital Mount Erebor (59) is added to Pecten's East Fellonia and the knights can no longer control the areas 57, 60 and 74. What remains of the Order of Richar seeks refuge in Errechania. The areas 61 and 72 are offered to the Errech as protectorate. - At 41 and 42 a unit of Ferret Assassins is sneaking around. They made life of the Drogret at area 42 quite miserable, but were eventually hunted down by local units. - At area 64, which once belonged to Ferretsnarf's Stoatoic Empire, there's a hidden battle going on between sneaky units of several nations. The Errech try to defend their research lab from attacking Therradorians and Ferrets, while there’s also a unit of West Fellonian Inquisitors stalking around. The grand prize is the cure for the blight, which is a medicine developed by Errechania for the Blight of Moriyen. This blight, originating from Moriyen (44), turns people into zombies and rapidly spreads in Therrador’s capital city, the Citadel of Steel. The Errech employed some less subtle diplomacy to force West Fellonia to retreat from area 64. With the Fellonians gone, they manage to fend off the forces from Therrador and the Stoatoic Empire. So area 64 remains firmly under Errech control. - The population of Moriyen (44) is slowly growing again, because it received a cure for the Blight. It has become a satellite state of Errechania. - Area 50, the last area of the Stoatoic Empire, lost its status of satellite state of Therrador. The Therradorians prefer direct control over the area. Therefore, the last dark green area will turn grey. - Errechania and Therrador exchange territories. The Errech got a hold over area 67, but the Therradorians sneaked behind them, cut off supply lines and regained control over area 65. Furthermore, as can be seen, the Errech moved a huge army into Therrador’s capital (48). The Errech leader, Lord-General Renneram, almost died after being shot with a steam-powered ballista, but he survived and called the attack. After a fierce battle, it's a stalemate: the Therradorians keep their citadel’s inner circles, but the outer circles have been conquered by the Errech. The Therradorians who were infected with the Blight were kept in the outer circles, so the Errech have to deal with them now. However, Renneram ordered to start administering the cure. That's more or less where I ended. The last battle will be posted here, as well as the winner. Next up: the game's last battle. Therrador's main army engages the coalition forces of Quelaran and Drogor at area 16. First I'll post the fluff and then how I worked out this battle in terms of game mechanics. For now I'll present the involved armies. Quelaran is filled with new hope. After some pressure by Princess Su’rel, the senate approves Prince Dolar Qatar ascending the throne and the people regain faith in the government. At the same time news from the south reaches the City of the Seas: the Wrath of the Sun besieges the Citadel of Steel itself. Now that the Errech have penetrated to the beating heart of the Therradorian warmachine, Quelaran and Drogor prepare to launch the next assault. An army of Kharkat, humans loyal to Quelaran, has formed at area 15, while the Avenging Brothers of the Bloody Oasis are mobilising at area 17. The war is in its final stage. However, for the hard-pressed Wrath of the Sea and the Grand Army of Drogor, the war is far from over. They had to regroup at area 16, a necessary step back. The Drogret aren’t too happy about this move, because moving back is the wrong direction. The Quelar, on the other hand, finally catch some breath after months of running and fighting. Despite the fact that they’re still in Therradorian territory, the situation in the camps of both armies is initially stable. Both Quelar and Drogret forces stole enough from the Therradorian and Snailglorb settlements at Smearslo to sustain themselves for a few days. The next step is to get a supply line to the City of the Seas, which is established without trouble. Apparently, the Therradorian forces are keeping their heads down for now. A train of refugees crawls through the area like giant centipede. Thousands of Quelar settlers and their human slaves are leaving Smearslo, heading back to Quelar territory. The Wrath of the Sea helps them on their journey north, but can’t supply them. Everything is needed for the battered troops. While the Quelar have their hands full, the warriors of the Grand Army of Drogor are restless and eager to continue the war. Sure, they haven’t really shaken off the injuries of the previous battle, but the inspiring presence of Karnish II and Orgrok Mandor makes them forget the pain. Karnish declared the Therradorians are the best sport in Drogret history. This almost caused the entire army to run back to Smearslo. To calm down the impatient troops, Drogor Shamans work day and night to get the wounded Quelar and Drogret back on their feet, so the army is quickly ready to pull out again. Wavelord Xurel regularly checks the infirmaries. He is in command while the Prince is away to fetch the Kharkat army. Prince Dolar Qatar was still recuperating from his Blight infection when he left. Hopefully, he is sharp enough to manoeuvre over enemy territory with his usual skill. Xurel wishes his Prince to return soon. He has a bad feeling and intelligence reports get more troubling by the day. Apparently, the Legion of Steel is re-arming and gathering again, Jack of Steel is still alive, a powerful individual has joined the Legion, King Slobglobsa is gathering more Snailglorbs to join the Therradorian cause… Therrador might be a battered nation, but it’s far from defeated. One day a diplomat shows the Wavelord a map with locations of enemy troops. Xurel shakes his head, looking at the map. The Drogret erupt in celebration. The Quelar silently start preparing. At dawn, Wavelord Xurel, accompanied by three White Bolts, flies to the shore. There he walks to his ankles into the sea. In awe the four winged Quelar stand and watch a tidal wave rolling in their direction. Xurel picks up a hand-full of salty wet sand and kisses it. They fly up, while the sea roars under them and washes over the dunes. When the water calms, hundreds of small, fish-like figures emerge from the water and form regiments on the beach. Xurel lands before the leader. Prince Dolar Qatar soars through the sky to get an overview of the situation. He can hardly believe his eyes. The supposedly beaten Legion of Steel is on the offensive. How can there still be so many Therradorians? He counts about twenty units, plus three units of Snailglorbs. It has never been this large, and the last battle wasn’t exactly easy. The Bloody Oasis forces aren’t fit to take this on. The Kharkat reinforcements won’t be enough. The Prince realises he needs the Avenging Brothers, but that army is hardly mobilised and too far away… Prince Dolar Qatar turns north, having made his decision. The Avenging Brothers simply have to come. A patrol of White Bolts flies over the Wrath of the Sea’s camp and urges all troops to take cover. Soon after, the Therradorian Trebuchet commences its bombardment. A giant rock lands just before the Wavelord’s tent and an explosion of pieces of rock levels everything in a range of five meters. Xurel slowly gets up, shrugs some dust from his wings and estimates the damage. One of his staff officers looks badly wounded. Wavelord Xurel takes to the sky, while the White Bolts and Quelee scramble and hasten to his side. As the Quelar flyers draw near to the Legion of Steel, they’re met with a hail of arrows. They spread and dive down. Fast and bloody hand-to-hand combat erupts around the Trebuchet. Therradorian archers draw hand weapons and jump to the aid of the warmachine crew. Meanwhile, a massive amount of steel-clad Therradorian legionnaires marches forward, backed by Archers, flanked by Snailglorb infantry. The Quelar pull back a little, and not only because it starts to rain arrows. Only two of their units, the serpent-riding Dashar Knights and the allied contingent of Errech Arleesar, are fit to take on that wall of steel. The Wrath of the Sea backs off further and further, while the Yrtlin Aloka try in vain to slow down the Therradorians with their throwing-tridents. The Quelar units quickly scuttle to the flanks. Deafening voices scream as one. The Grand Army of Drogor charges over the muddy field, shrugging off the rain of arrows. But the units of Therradorian Swordsmen pick up speed as well. With a mighty clash, the two armies connect. Orgrok Mandor’s camel riders, the Berserkers and the Desert Beast Herd punch a deep hole in the Therradorian battle line. The other Drogret units prevent the line from closing. The Wrath of the Sea’s ground units are reinforced by the Ichtei and a group of Priests. Once again, the Quelar will go after their nemesis, the Snailglorbs. On one side, the Retorii lead the charge, as these veterans of the first war for Smearslo can put down giant gastropods quite efficiently with nets and tridents. On the other side of the field, the Dashar Knights spur their sea serpents and prepare for slimy impact. Wavelord Xurel presses on with a small party of White Bolts and Quelee, relying on their speed, their blades and determination to get to the Trebuchet. The Therradorian Archers are pinning them down and the number of Quelar nobility is quickly decreasing. The Trebuchet hurls another rock, this one sent to an Ichtei regiment. The warmachine crew isn’t too concerned yet to start packing and with their eyes they follow the rock’s trajectory and the following destruction. Then the Master Engineer, peering around through goggles, suddenly alarms his men. From the north the Quelar reinforcements are arriving: five units of Kharkat and the most dreaded flying unit, the Divine Guard. The Trebuchet slowly turns to this new threat and flings a giant rock at it. The Divine Guard experiences some turbulence when the rock soars through their loose formation, to land between the Kharkat. After this last shot, the warmachine crew quickly starts to pack. The line of Therradorian Swordsmen has been divided in two due to the Grand Army’s attack and the Legion of Steel is wavering. However, the Therradorians learned from the last battle. The Drogret that passed the line are met by salvos of arrows and intercepted by Therrador’s elite Knights, led by general Jack of Steel himself. Orgrok Mandor lets out a war cry when he sees Jack’s banner drawing closer. He spurs his camel and leads the Drogret cavalry into a frontal collision. Meanwhile the Quelar ground troops work their way through the Snailglorbs and engage the Swordsmen. The tired Quelar are motivated by the allied unit of Errech, who eagerly fight Therradorians after the battle in the south. On the other side of the field are the Quelar flyers, now reinforced with the Divine Guard, still locked in combat with the Therradorian Archers that guard the Trebuchet. They are stuck and forced to ground combat, because taking off into the sky would risk getting their wings shot to shreds. Crown Prince Dolar Qatar flies over to observe the battlefield. The approaching Kharkat plough through the arrow barrage and prepare to engage the Archers to help out the Quelar nobility. Orgrok Mandor and the Drogret shock troops push back Jack of Steel’s Knights. But it is not enough. The line of Swordsmen is holding back the Quelar ground troops and the gap the Drogret made is getting smaller. The Grand Army is forced to concentrate on the main battle and can not engage the Archers. And that is bad news, because now all Archers concentrate on the Divine Guard, White Bolts and Quelee, who are at the edge of defeat. To make matters worse, the Kharkat that could save them are engaged by a reserve unit of Steelblades. Someone is coordinating the Legion of Steel extremely well. Dolar scans the field. Who is this strategist? It can’t be Jack of Steel. He has proven to be a very skilful commander, but he is locked in combat with Orgrok Mandor and can’t possibly oversee the situation and give orders. There has to be someone else. Prince Dolar Qatar remembers the Supplier, one of the Three Guardians of Therrador. The Supplier was eventually slain, but if there are two Guardians left, one could be here… But he can’t see this person and there is no time to find him. The Wrath of the Sea is about to break, and if they break, the Grand Army of Drogor will be crushed. The unthinkable will happen if something doesn’t change soon: the Quelar and Drogret campaign against Therrador is about to fail. Dolar quickly returns. Heavy drums and a horn sound in the distance. Wavelord Xurel, hit by five arrows, pushes two Archers away and takes off into the sky. His wings are severely hurt and two more arrows pierce them, but he flies vigorously and swoops back with renewed strength. The Great Guardian of Therrador sighs and nods to one of his messengers. A decisive victory was so very close, but these fresh reinforcements might just turn the tide in favour of the Quelar and Drogret. Everyone knows what to do. The Trebuchet leaves, although pestered by Divine Guard. In its wake the Archers slowly regroup, pick up their wounded, and move back, covering themselves by shooting at will. Suddenly they stop. A horn sounds and all Swordsmen turn tail, some throwing down their shields and dragging wounded comrades with them. The Archers release a few salvos on the Quelar and Drogret, to force them into hiding. The Steelblades try to run off as well, but the Kharkat don’t let it happen and catch them. To Orgrok Mandor’s dismay Jack of Steel also pulls back. He orders to pursue. However, apart from the Kharkat and Drogret riders, no unit is actually able to chase the Therradorians. The Legion of Steel manages to get away again and leave the victors defeated. Hello Elias Is there any chance of you running another fantasy themed AotB in the future? Nope Games like these take a hell of a lot of time. My life has changed so much since this began. Ferretsnarf says: Would you screw a Half-Orc? Kitsune (formerly Lathian) says: Yeah, but wilderness, urban or planar? You're = Possessive form of You. Example: You're car is nice. Your = Contraction of You and Are. Example: Your a fool. That last battle was a strange one. Therrador has many defensive units, but was attacking. Quelaran and Drogor have mostly aggressive units, but were defending except for the Kharkat and Divine Guard. There were also a lot of wounded. Here's how I worked out battles, taking the last one as an example. The total offence stats of the Legion of Steel was 40 plus a ranged attack of 35. The Wrath of the Sea defended with 22 and then the Kharkat and Divine Guard attacked with 23. The Grand Army of Drogor defended with 27. With these numbers it’s already taken into consideration that wounded units are weaker. Especially the Quelar suffered from that penalty. The next thing I considered was total unit strength, that means for each army I added the total offence and defence stats. This somewhat indicates the force with which an army presses on the enemy. This was for Therrador 142, for Quelaran 114 and for Drogor 77. Lastly, there’s the X-factor. For example, the Drogret had an elevated mood, because Karnish had said the Therradorians are the best sport he ever encountered and hence declared Therrador Drogor’s nemesis (the nemesis rule means that you declare one nation your nemesis and then your troops are highly motivated when fighting units of that nation). The Therradorians were worried because their capital was besieged by the Errech. On the other hand, the Great Guardian joined them and they had superior intelligence. I made a lame joke of it in the fluff, but besides having better scouts, the Therradorians were actually tactically superior, clearly more organised and made very effective use of their units. So the Legion of Steel had less unit strength and the Therradorians were perhaps a little taken aback by the happiness of the Drogret, but the Legion had actually more power than the combined forces of Quelaran and Drogor. Ranged attack counts heavier than normal attack, especially when tactically used. What changed the battle in favour of the Bloody Oasis was the coming of the Avenging Brothers. These units were just built and actually not able to move that turn, but in cases like these, fluff can bend the rules. And if we had continued, Drogor and Quelaran would have sent unit after unit into Therradorian territory. The current situation more truthfully represents the fate of Therrador. Of course the Legion wouldn’t let itself be crushed, so it retreated before anything nasty happened under the skilful coordination of the Great Guardian. As with the first battle against Quelaran and Drogor, the Therradorians killed more than they lost and retreated in time. In my opinion the Bloody Oasis couldn’t have sustained more of such ‘victories’. If it weren’t for the Errech banging on the gates of Therrador’s heart, there’s a good chance Quelaran would have eventually turned grey. Dolar Qatar, now the King of Quelaran, looked over the dunes at the direction of the Therradorian army. They had been beaten back again, but the losses had been great, too great. The Kharkat had suffered and the Quelar nobility had been severly weakened by the arrows of the humans. If it wasn't for the Avenging Brothers Quelaran could well have fallen this day. He owed the Drogret a great debt, one he intended to pay one day, when the threat of Therrador had been finished, once and for all. A slight smile passed his lips, he turned towards the camp and walked to the command tent. "For now the danger has passed, but it hasn't vanished" Xurel spoke. He looked over the maps spread across the table "If the Fellonians..." "We can't ask the Fellonians to aid us, they won't come." Dolar replied. "They've just won their first real war against the Order of Richar, their forces are on the other side of the continent and they're perfectly safe and comfortable. No, they won't come to our aid. Besides, we have the support of the Drogret and the Errech, the most powerful nations in the world. With such allies Quelaran can best any foe, even the bloated beast of Therrador" there was a bitter sound to Dolar's voice. The treachery of Therrador had hurt the Quelar greatly. Wavelord Xurel waited a moment before continuing "You are right, my king. But without the support of the Fellonians we can't press on our attack, our forces are too weary, too depleted. And attacking the Therradorians would be suicide before we can implement your reforms to the military. Soon, yes, when the reforms are implemented and the armed forces are modernized, but for now we must hold our positions." Dolar nodded in agreement. "We can't go on the offencive ourselves yet, but the Errech are at the gates of their capitol, which is almost undefended due to their campaign against us. The humans aren't fools, they won't risk their entire country for the chance of conquering Quelaran. They will submit to peace on the Errech's terms and ours. With the Blight on our side, they have no choice." Dolar sighed and rubbed his face with his right hand "This war has kept us from rebuilding Ancient Quelaran beneath the waves now that it's been rediscovered. The sooner this is over and the sooner we can rest assured that the Therradorians will never threaten us again so we can focus on that task, the better for us all"
King Karnish entered the tent, his huge form covered with the blood of his enemies. Both of the winged Quelar looked up at him and greeted the Drogret. "By the ancestors that was a fine battle!" he bellowed, slamming his fist on the table. The Quelar looked at each other, amused. Their allies were a strange folk indeed. "We will go after them soon, yes?" Dolar shook his head "King Karnish, for now we must stay put. We were victorious, yes, but our forces suffered much more than the Therradorians did. Whoever is leading the humans is an excellent strategist and if we were to attack now with our forces weakened, we would surely be beaten. We must bide our time, tend to our wounded and when we are back to our full strenght we can let the humans of the south feel the wrath of our armies as we wreak righteous vengeance upon them." Karnish seemed to consider the young king's words and nodded "What you say holds merit, even though it's not the warrior's way. We should seek out our foes and crush them, but your right. There's no point in throwing lives away. We'll wait, for now, and go after them later". Dolar bowed his head in thanks before turning to a scribe. "Send a hawk to the Therradorians, offering them peace. The conditions are as follows: One, the war criminals Prime Minister Faz, King Slobglobsa and General Splatton of Shelldormya must be handed over to us immediately for trials against Quelaran. Second, the areas 16, 29, 30, 31, 32, 33, 34, 45, 46 and 47 must be handed to Quelaran within the next three moths. That should give them enough time to evacuate all civilians. All those found within the borders of Quelaran after this time are considered prisoners of war. Those who are willing to swear fealty to me and to Quelaran will be given equal rights to the indigenous human slaves of Quelaran. I expect an answer within two weeks." The scribe bowed and exited the tent. Dolar turned to his companion "I expect the humans to refuse. Their pride won't allow them to accept that they are already defeated. Certainly, the war will be long and bitter, but as things stand, with their last allies either dead or dying and their lands in the grips of the plague they can't stand alone. Many of our people will lose their lives. Many of them will also die. There will be much suffering and grief. Therrador is dying, alone, loathed and despised. We grow stronger again for the first time since this war began while they grow weaker every passing week. Eventually, they will succumb. Eventually, they will be but a memory. But there's still a long way to go for that to happen, a long and bloody road for us, my friends." In Quelaran, far from the front lines, new doctrines were being put into use. Lessons learned from the Therradorians and Silesians were adapted and applied. The harshest teacher, war, had taught the Quelar its deadly arts. In the past the troops of Quelaran were fielded to fight bandits and small bands of reavers. In this new world, dominated by what man called the beast, they had to face much more dangerous foes. And the forces being mustered and trained now were capable of facing these new threats and overcome them. There's no stopping the might of the drogret! Another flawless victory for the grand army! Hoorah! Oh, and Orgrok demands Jack of Steel to face him in single combat. Such an opponent, and managed to elude his axe two times, but no more. This will be his last chance to die a warriors death. Dwarven gravitational theory states that enough ale will make anything fall down. Heh, nice battle. I am not so sure about the what Therrador will do now. So give me some time to think about it. Lord Renneram of the Errech poses the following ultimatum. It is non-negotiable. Firstly and most immediately, the capitol and armies of Therrador will surrender - to the Errech, not the Bloody Sands. The soldiers will be treated with due honour as prisoners of war, and then reformed into auxillary units of the armies of Errechania. Second, the remaining territories of Therrador after the territories demanded by the Quelar have been ceded will become annexed into Errechania. The autonomy of these territories depends on the behaviour of the populace - citizens of Therrador are to be granted equal status to those of all other peoples of Errechania, save for the Weaseloids who are pariah. Third, the administration and religious orders of Therrador will pledge to never again lift their hands against the Errech. Functionaries and local leaders who submit, will of course retain positions as befitting of their stature. In return for this pledge, every soldier and leader is of course offered complete amnesty for his actions during the war, save those which he has been condemned for by the legalities of Therrador itself. If these demands are not met, the inner city will be bombarded with plauge-ridden corpses and every man, woman and child in it will be slain. Every stone will be torn asunder, and the civilisation and culture of Therrador will be wiped out. I am Lord-General Renneram. My word in this matter is absolute, and my will is not to be challenged. OOC: So what exactly is happening now, we don't get any more turns right, but there still will be an end fluff? There are certainly still villages of them around in my occupied areas, unless they all just vanished into puffs of smoke while I wasn't looking. well if there ARE some left then that is something that I myself am unaware of. Tylarion, there are no more turns. However, it could greatly affect the outcome of this game if you accept or decline the terms offered by King Dolar Qatar and/or those offered by Lord-General Renneram. About the population in the former lands of the Stoatoic Empire: most of the Weasloids left their settlements and fled deep into the Ferret Woods, as ordered by Squqarkrah, ruler of the Stoatoic Empire. There are still a few hidden villages of stubborn stoatoics in the Errechania part of the former Stoatoic Empire. There's a somewhat larger population of them in the Therrador part. Especially older Weasloids, who were born and raised in a certain village and lived their entire life there, won't leave home when the nation's torn up by war, nor when the government tells them to. There are also a few militant groups of guerillas, who simply disagreed with the government's decision to retreat. However, most of the Weasloids are loyal to their ruler, so let's say about 80% of the Weasloid civillians left. That doesn't mean the lands of the former Stoatoic Empire are deserted. Of course there are Therradorian and Errech settlers, but the largest group of inhabitants consists of refugees from Silesia. When Silesia, a densely populated nation, fell to Drogor, a very large train of refugees left the northern lands and headed through Quelaran to Therrador. The Therradorians were busily colonising the areas of the Stoatoic Empire, so they just chanelled the Silesians to these new lands and employed them in the lumber industry. In the Errech parts there are also human refugees settling, although these come from Mount Erebor and the surrounding areas of the Order of Richar. In any case, if anyone was wondering, I ordered everyone to leave back to their homeland in the forest because I decided it would be better for my people to no longer remain involved in the wars in the heart of the continent. If you think that's going to help you escape retribution, you are sadly mistaken. The guilty will be brought to task, if the whole forest has to fall for it.